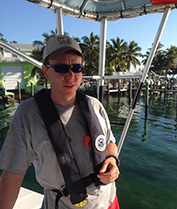 Brady has been part of the Key Largo buoy team since 2010 and has also worked as a boat captain for Florida International University's Aquarius program. He spends much of his time on the water, maintaining the marker and mooring buoys found throughout the sanctuary. Brady originally came to the Keys to work an internship with The Nature Conservancy in 1998 after earning a Bachelor of Science degree in Biology from the University of Wisconsin, Eau Claire, with a minor in Marine Science from the Gulf Coast Research Laboratory in Ocean Springs, Mississippi. He lived in Key West for six years, becoming a PADI Scuba Instructor, and later a U.S. Coast Guard Certified Captain, before moving to Key Largo in 2004. He worked as captain of the R/V Research Diver for University of North Carolina-Wilmington's National Undersea Research Center until 2005 and went on to Captain a 100 ft. private yacht which traveled up and down the U.S. east coast, frequenting the Bahamas and other parts of the Caribbean Sea. This led him to transit the Panama Canal to Alaska and back, stopping at many points in between. Brady's dedication to the mooring buoy program corresponds with a deep love for the ocean and the passion to continue protecting the Florida Keys ecosystem.